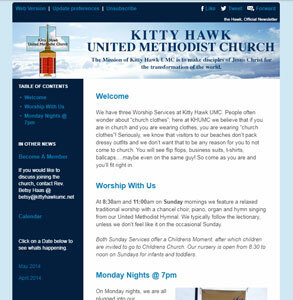 Email newsletter system setup for a church on the Outer Banks of North Carolina. The online newsletter offers the church an easy and inexpensive way to offer their newsletter to their congregation over their standard paper version. Overall it saves them time and money and allows them to more actively manage their subscriber list and understand better what content they like because of the reporting and statistics management.